Replacement of a speed loch transducer by a NMEA to analog paddle-wheel signal converter. No extra hole in your boat. No cleaning of the paddle-wheel. Gives speed over the ground. More reliable than a paddle-wheel. More accurate than a paddle-wheel. No adjustment necessary with most of the speed logs. Can also be used without speed log using the analogical output to connect a repeater. 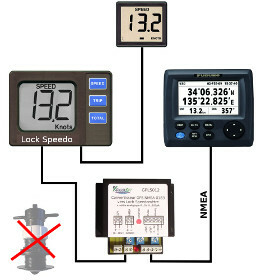 With the GPS NMEA to analog paddle-wheel signal converter GPLS012 you no longer use any through-hull transducer with your speed log. 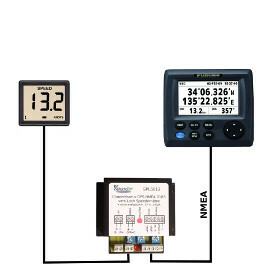 The device reads your speed over ground from the GPRMC NMEA sentence sent by the GPS. It creates a pulsed signal identical to that of a transducer and transmits it to the speed log or the navstation . All the functions of the speed log are available. More the speed log displays now the speed and distance over the ground which is more accurate than the water speed. If you only need to display the speed over ground of the boat on a repeater, you do not even need to have a speed log device. 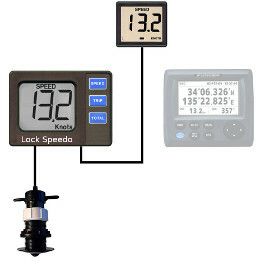 You can connect directly an analog repeater (digital or hand) to the GPLS012 to obtain a display of the speed anywhere on the boat. Note: For professional ships, this device is also available with 200PPNM output. More info. Traditional mounting of a speed log with a through-hull transducer and a repeater at the helm. The transducer is very sensitive to algae and shells that can block it. Its accuracy is affected by the degree of soiling of the hull. The display of the speed and the distance are not reliable. Frequent cleaning of the transducer is essential. The through-hull transducer is no longer used. The speed log device uses the speed over ground provided by the GPS. There is no longer risk of blocking of the paddlewheel, the accuracy is increased. Safety is enhanced by the removal of a hole in the hull. All functions of the speed log are available. The repeater in the cocktpit remains connected to the speed log. The speed log works now with the speed and the distance over the ground which is more accurate than the water speed. The repeater is connected directly to the GPLS012 device which is connected to the GPS. No need of a through-hull transducer, no hole in the hull, no need of a speed log device. You can use any analog repeater with hand or numbers. This is the cheapest solution. Power supply : 12 Volts (9 à 16 Volts) 20 mA. 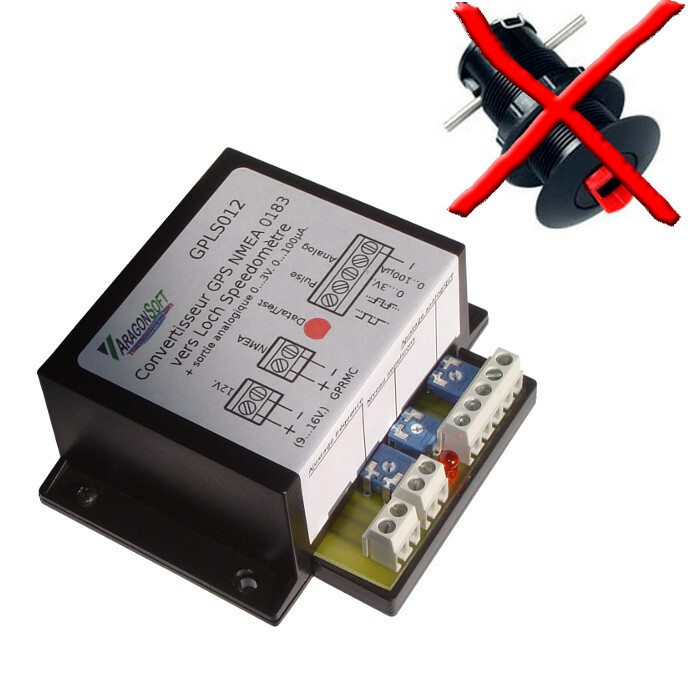 Input : Serial NMEA0183 GPRMC sentence with or without checksum ground connected to 0 Volt. Speed Range 0 to 40 knots. accuracy: 1% ( 50 knots 10%). 1 pulse outpout +-2.5 Volts. 1 analogic output 0 to 3 Volts or 0 to 100µA for analog repeater (digital or needle). Setting of the pulse frequency depending on the speed + - 50%. Setting of the amplitude of the pulses. Setting of analogic output level. Display: 1 LED : Test device at starting and indication of NMEA data input. Size and weight : 98 x 88 x 33 mm. 85 gr. Operating temperature: -30 +50 °C.